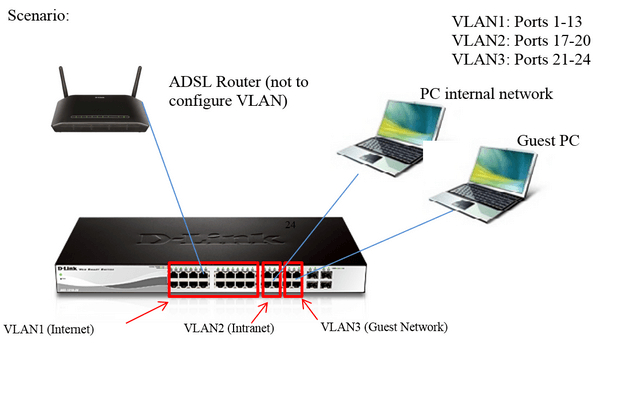 How to configure Asymmetric VLAN in DGS-1210 Series? How to configure Asymmetric VLAN in DGS‑1210 Series? 1. Access the web interface of the unit using the default IP http://10.90.90.90 (Remem-ber to set a fixed IP in the same range on the computer). 2. 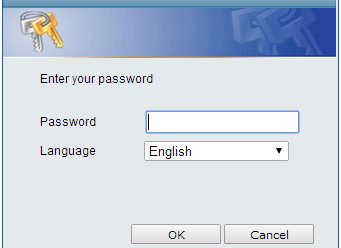 Enter the password "admin" default one. 3. Once inside the configuration interface refer to "VLAN". 4. Inside VLAN you must activate asymmetric VLAN and then apply. 5. To edit the VLAN1 click number 1 in the VID column. 6. Ensure that all ports in VLAN 1 are untagged. 7. To create VLAN 2 must click on the "Add" button. 8. Set the VID number to 2 and add a name to the VLAN, e.g. “Internal”. Then config-ure port 7 as Untagged, this is what the router is connected to. 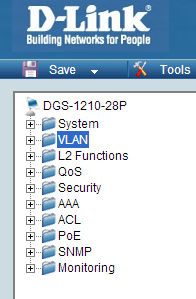 Also set ports "17 to 20" as Untagged, these will be used by this VLAN. All other ports should be set as “Not member” and then apply the changes. 9. Click on "add" again, to add VLAN 3. 10. Set the VID number to 3 and add a name to the VLAN e.g. “Guests”. ”. Then config-ure port 7 as Untagged, this is what the router is connected to. Also set ports "21 to 24" " as Untagged, these will be used by this VLAN. All other ports should be set as “Not member” and then apply the changes. 11. Click 802.1Q VLAN PVID. 12. Configure ports 17 to 20 with PVID 2 and 21 to 24 with PVID 3. Port 7, which the router is plugged into, can remain as PVID 1 because it belongs to VLAN 1, apply the changes. 13. Save the configuration on the switch for that go to Save> Save configuration. 14. Click the "Save Config" button. 247 people found this useful.